CentrikBlogsLegal AdvisoryDebt Recovery ManagementEssar Steel- What led to the landmark case under Insolvency and Bankruptcy Laws? Amongst the 11 high profile case under the purview of Insolvency Code, Essar Steel has attracted a lot of attention. In this article we have discussed about the facts of this case and the first judgement passed by Gujarat High Court. The Gujarat High Court on Monday dismissed Essar Steel India Ltd.’s appeal against a central bank order that asked creditor banks to start insolvency proceedings against the steelmaker, lawyers on the case said. The ruling is a boost to the government, which in May tweaked Indian banking laws to empower the Reserve Bank of India (RBI) to tackle the country’s bad debt issue, allowing the RBI for the first time to direct lenders to force defaulters into insolvency courts. The ruling paves the way for the start of bankruptcy proceedings against Essar Steel, although the company could appeal the ruling. The company did not immediately respond to a Reuters request for comment. 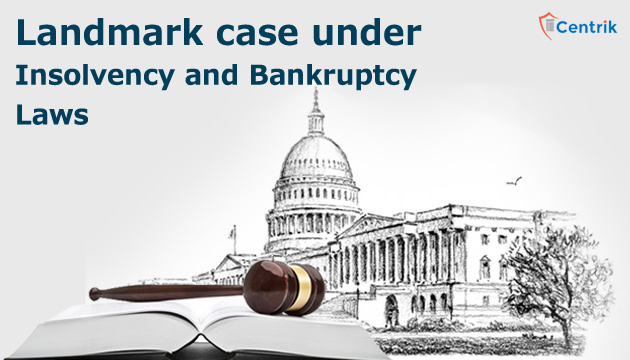 Essar Steel had argued that it should have been given an opportunity to present its case before the Reserve Bank of India decided to include the company among 12 defaulters that would be referred to bankruptcy court. Essar had also argued that proceedings could result in the company’s demise when it was “almost in the stage of revival” and working to resolve its debt problems, according to court documents. The RBI had in June asked lenders to start insolvency proceedings against 12 companies, as part of new powers it gained this year to help the country cut down on the more than $150 billion in stressed assets in the banking system. On Friday, Essar Steel’s counsel Mihir Thakore argued that the SBI and other lender banks under the Joint Lenders Forum may not have approached the National Company Law Tribunal (NCLT) for insolvency proceedings, had the RBI not issued the circular. The company was challenging the RBI’s directive, not the SBI’s decision. The State Bank was asked by the RBI to file a case before the NCLT against Essar Steel through the circular, advocate Thakore said. The action was a violation of his client’s fundamental right to equality before the law and equal protection of the law under Article 14 of Constitution, he said. Though the Insolvency and Bankruptcy Code is in force since December 2016, the lender banks did not opt for insolvency proceedings because they knew it would “jeopardise company’s operations” as suppliers may stop supplying material on learning about such action, Thakore said. RBI counsel Darius Khambata said the steel firm had suppressed facts and misled the court to get a favourable decision. He argued that though Essar Steel at one point “even agreed to go to NCLT,” the company did not mention it in the petition. Had it mentioned it in the petition, the court would have disposed of the case immediately, Khambata said. “The company was aware about SBI’s action. They were also aware that lenders will file for insolvency proceedings .You cannot play games with the court. This court is being misled,” the RBI lawyer said. Essar Steel owes lenders around Rs 45,000 crore ($6.99 billion), of which Rs 31,670 crore had become non-performing as of 31 March 2016, the Mint newspaper previously reported citing court hearings. With the introduction of Insolvency Code, few top notch cases were under its purview and RBI took suo moto cognizance of these companies. The defaulting companies list were sent to NCLT for speedy disposal of their cases. Amongst 11 high profile cases 8 of them are almost on the verge of getting resolved. This will free a lot of stressed assets and a lot of money will flow back in the market making the competition free. Insolvency Code has attracted a lot of attention in a very short while due to its effectiveness and regular amendments. It is to be noted to witness how far and effectively this can go on resolving such issues in the long run once it becomes old like any other common law.